What should I do immediately after an accident? The key steps to take immediately following an accident. What’s Eating the Sandwich Generation? Many factors contribute to the swelling size of the Sandwich Generation, but quite simply it’s because people are living longer thanks to better medicines and health care. Take also into account that women are waiting longer to have children, and that explains why more than 22 percent of the American population find themselves juggling a career, marriage and caring for both children and aging parents. On top of facing the stress in their finances, Sandwich Generation couples’ dreams of a secure retirement or travel slowly disappear. The added strain as well as not being able to find time for each other can also affect marriages. Experts suggest that taking the time to care for yourself and your core family is critically important. In addition to marriages, careers are often impacted as well. Caregivers who work full time struggle to strike a balance. Some are deciding to switch to part-time employment and, as a result, are giving up important benefits. Another component in an intergenerational household is the psychological effects of role reversal. At some point, the child must become a parent to the parent and deal with awkward situations involving day-to-day personal care. While this time is stressful, there are emotional benefits for the family all living under one roof. There is an enriching outcome for children who are close to their grandparents and get to spend quality time with them. Not all sandwiches are the same. The three types of sandwiches that make up this unique generation include Traditional, Club and Open-faced. Traditional: The Traditional Sandwich Generation includes adults sandwiched between aging parents who need care and/or help and their own children. Club: The term club sandwich generation refers to a generation that is helping to care for three other generations. 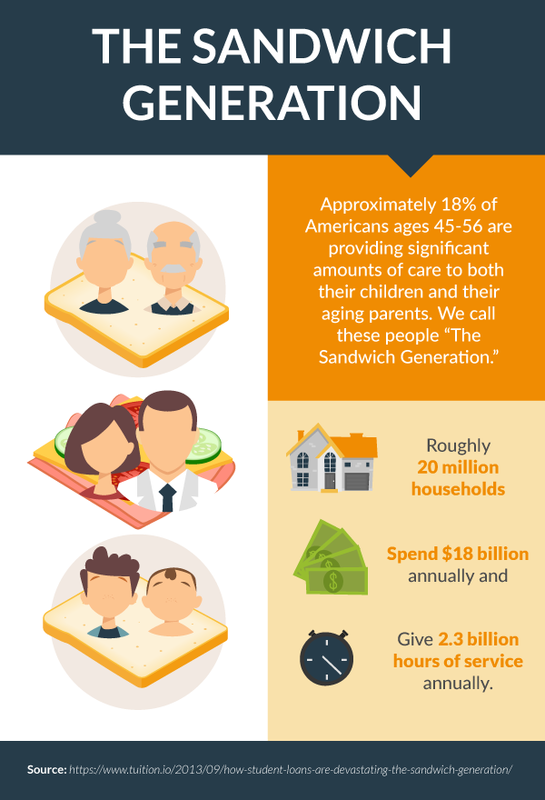 The term is a spin-off of the term sandwich generation, meaning a generation caught between the demands of caring for children and for aging parents. Typically members of the club sandwich generation are caring for elderly parents, providing some support for adult children and helping to care for grandchildren. Some may even have minor children still at home. It’s wise for caregivers to consult with a tax attorney or accountant with experience in elder care. Family caregivers who pay at least 50 percent of their loved one’s care can claim the elder as a dependent on their taxes. If you can’t claim your loved one as a dependent, there are still ways to deduct expenses such as prescriptions, medical insurance premiums, medical supplies, glasses, hearing aids and mileage for doctor appointments. Networking with other caregivers is a good way to discover how to access benefits through Medicare, Medicaid, the Veteran’s Administration, long-term care policies and Supplemental Security income.